A squad of 16 of Chichester’s combined under-17 and under-20 team put up fine performances in their National Youth Development League match at Southampton. With all athletes having to combat the sultry and oppressive heat, the standard of competition was remarkably good both on the track and the field. There were personal bests galore from Chichester’s men, both in the sprints and the middle-distance races. An example of the quality of athlete on view was the appearance of national cross-country champion Zak Mahamed running for his Southampton club as well as a clutch of UK top-ten ranked throwers from Bournemouth and Brighton. There were personal bests galore from Chichester’s men, both in the sprints and the middle distance races. Max Lambkin was again on top form with a new PB of 11.7sec in the 100m, this after a battling run in the 400m hurdles. He followed the 100m with a 23.8sec clocking over 200m, while Jacob Piper also broke the 12-second barrier with 11.9sec and then recorded 24.1sec in the longer sprint. To complete a fine trio of sprinters, Brandon Bell looked to be getting back to his best with 12.2sec and 24.6sec. Ethan Hartley looked sharp and ran a well-judged 400m to finish strongly in the home straight with a new best of 53.2sec and went on to partner Will Broom over 800m. It was good to see Broom back in action on the track after an enforced lay-off through injury and it was early in the match that he had the first opportunity to test his fitness in the 1500m. After a controlled first couple of laps, the Chichester athlete increased the pace to pull away from the rest of the field and stride home clear of the rest in a new PB of 4.05.2. Clubmate Ben Collins was able to stay with Broom until halfway and hung on bravely to also smash his lifetime best with 4.11.5 and give Chichester a double victory in the under-20 age group. Showing the club’s strength in the middle-distance events, Alfie Spurle and JJ Staples in the same race showed good speed for the under-17s. Broom made it two wins out of two with another good showing over 800m finishing just outside the two-minute barrier with 2.00.8 while Liam Dunne used the 800m as preparation for his English schools 1500m in a couple of weeks with a comfortable 2.00.7 clocking. New member of the team Olly Page supported Dunne well as B string in his first race for the club, also achieving a PB of 2.39.6. In the longest race of the day, Collins bravely lined up against Mahamed and did well to finish in 9.27.2, with most athletes taking advantage of the impromptu water station put up for the long-distance races. In the field there was a good triple jump showing from Page, Spurle and Staples while thrower Dylan Giles showed the benefit of his recent coaching from Andy Hall in shot, discus and hammer, having to contend with a 15.60m shot put and a 50m-plus throw from the UK No1, as well as another 50m effort from the Brighton athlete in the hammer, another UK top ten performance. Mirroring what was happening in the men’s events, Alexia Everley had to contend with nationally-ranked athletes in the women’s throws. She stuck to her task, however, and showed a good deal of confidence as another member of Chichester’s flourishing throws group of athletes. 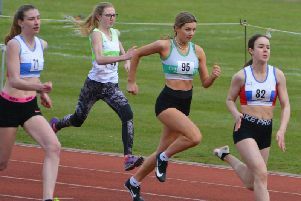 On the track, Jess Werfalli set a new PB in the 100m while Eloise Longhurst and Emily Russell made a good combination over both 200m and 300m. Longhurst’s strong finish saw her just fail to catch the early leader on the 300m while Emily Russell just got the better of things in the 200m. Maggie King did well to dip under 2.30 in the 800m, this after showing good form in the 300m hurdles with a 55.3sec clocking. Lining up for what was a new event for her, King produced a sound throw in the javelin but was another athlete who had to contend with the best in the UK, facing the country’s No3 in that event with an effort well over 40m. * Apart from Liam Dunne who will be on English schools duty, the rest of the squad will be part of the club’s senior team in the next fixture in the Southern Athletics League on Saturday July 14. Once again the match has had to be moved from the scheduled venue of Salisbury as the home club still have not resolved the issue over access to their home track – so teams will be once again travelling to Swindon as they did in June. Star of the show for Chichester at the Sussex under-13 track and field championships was Fionn O’Murchu. As part of the club’s cross-country team last winter and a top finisher in the Corporate Challenge, O’Murchu’s quality as a distance runner was already known but it was in the field events where he also excelled at Brighton. After narrowly missing out on medal in the 1500m despite a fast 5min 02sec clocking, he won bronze in the shot with 7.96m before striking gold in the long jump with a new personal best of 4.47m. Also in the medals on the track was Josh Dunne with a speedy 2.32.8 in the 800m – good news for Dunne, who will be in the same age group in 2019. Amelia McGurk finished 11th in the girls’ 800m while Emily Carman ran a 2.07 clocking in the girls’ under-11 600m. Two of Chichester’s female distance athletes have achieved the feat in the past couple of weeks of beating all the men. Ex-university student Emma Hughes was part of the club’s ten-athlete squad at the recent Downland Dash organised by Burgess Hill Runners, part of the West Sussex Fun Run League. Finishing s fine 63rd out of a field of well over 400 runners, Hughes was the first Chichester athlete to cross the line, narrowly beating the club’s first men home, David Pike in 65th and Marcus Hammerton one place later in 66th. While this is not the first occasion in the club’s history that a female athlete has led the club home, it is far from a common occurrence. Then just a week later in last Saturday’s Chichester parkrun in Oaklands Park, 14-year-old Lucy Toms showed a clean pair of heels to the rest of the 175 runners in the field to come home first in just over 19 minutes, beating all the men in the process. Her time was just 19 seconds outside her fastest ever over the Chichester undulating course, a fine achievement in the conditions. Another of Chichester talented juniors, 12-year-old Logan Cooper, was also prominent in the leading pack to finish a fine fourth.